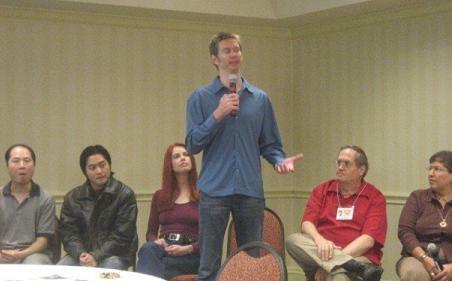 I just got back from my first event speaking in the internet marketing arena. And I have to say, it was a blast! It was Ken McArthur‘s Get Your Product Done workshop in Atlanta, Georgia, and it was HOT! Actually the event was quite intimate — not your average big seminar, but about 30 to 40 participants working with us one-on-one between the speeches. I shared the stage with Harris Fellman, Jason Oman, Matt Bacak, Simon Leung, Alex Nghiem, Frank Sousa, Glenn Dietzel, Ben Mack, and more. The picture above some of us on the expert panel, listening to Jason Oman make a point. The whole event was about product creation… so of course I spoke about interviewing, and had my new product for sale: Interviewing Unwrapped. Part of me thinks maybe he was just trying to throw me for a loop, because he had no way of knowing that I would have been able to handle that — but then the rest of me trusts him enough to know that he wouldn’t do it if he thought I’d fail. After my talk, he and Harris said I gave away way too much content… that my speech could have been a product in itself. I guess I’m having trouble focusing on marketing when I want to focus on information. The second night, we all hung out in the bar downstairs in the hotel lobby… me and all the boys. We talked about all sorts of mind-bending things like perception, sexual energy, relationships, universal principles and so forth… a more X-rated version of any spiritual conversation I’ve ever had. On the one hand, it was about speaking at an event. On the other, it was about networking and getting to know my peers on a more personal level. When you work on the internet, it’s easy to have lots of friends that you’ve never even met in person. But the biggest lesson I walked away with was the lesson of perception… we got into some deep conversations with each other, and a lot of people gave me their impressions of what I’m like and what I do. As a result, I got a clear indication of how other people saw me, and I was pleasantly surprised at a lot of it. It’s hard to do, but I recommend asking people point blank what their impressions are of you sometimes. If you get into a conversation where everyone’s being honest, and you feel that in your heart, then you can learn some valuable things about yourself — both your strengths and your weaknesses. And as hard as it may be to listen to what they say, you’ll never regret asking… and listening. That’s the #1 skill for interviewers, and the #1 skill in communication.